Google shows a special logo on their search page remembering special days. Google has already a large collection of these doodles. At April 3rd, 2013 Google showed a doodle to remember the 150th birthday 1) of Henry van de Velde, the famous Belgium architect. This doodle was made by François Schuiten and was shown on the Belgian, Dutch, French, German, Austrian and Swiss versions of the Google website. In the doodle, Google made a small mistake stating that it is celebrating the 100th birthday instead of the actual 150th birthday. The “G” Google is a tribute to the pointillist period of Henry van de Velde as the first “O” discusses his graphic work that brought him among the leading figures of the movement “Arts and Crafts”, the English equivalent of Art Nouveau. 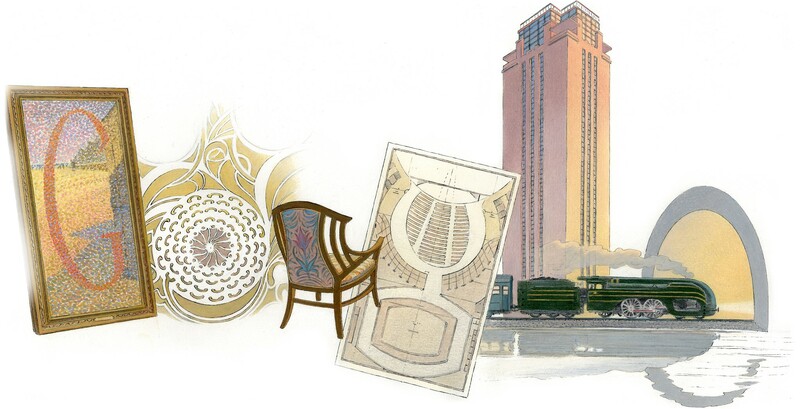 The second “O” refers to furniture and other objects born of his imagination while the second “G” brings the architect he was and his major projects such as the Théâtre des Champs Elysées in Paris. The “L” represents the tower of the University Library in Ghent, based on an evocation of artistic projects for the Belgian railways.